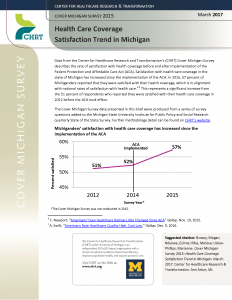 Data from the Center for Healthcare Research and Transformation’s (CHRT) Cover Michigan Survey describes the rate of satisfaction with health coverage before and after implementation of the Patient Protection and Affordable Care Act (ACA). 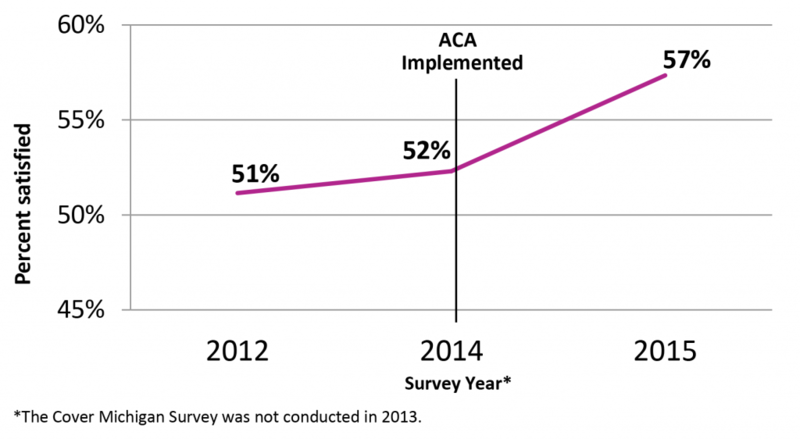 Satisfaction with health care coverage in the state of Michigan has increased since the implementation of the ACA. In 2015, 57 percent of Michiganders reported that they were satisfied with their health coverage, which is in alignment with national rates of satisfaction with health care.1,2 This represents a significant increase from the 51 percent of respondents who reported they were satisfied with their health care coverage in 2012 before the ACA took effect. The Cover Michigan Survey data presented in this brief were produced from a series of survey questions added to the Michigan State University Institute for Public Policy and Social Research quarterly State of the State Survey. Further methodology detail can be found on CHRT’s website. F. Newport, “Americans’ Own Healthcare Ratings Little Changed Since ACA” Gallup, Nov. 19, 2015. A. Swift, “Americans Rate Healthcare Quality High, Cost Low,” Gallup, Dec. 9, 2016.